It seemed that Northern Ireland got a good deal on the weather yesterday. While everyone was complaining on Twitter about rain and all my friends at Avenue 57 were getting their wellies and raincoats out, I was out in the garden with the girls & got two lots of washing dried on the line! Wearing lots of Room31 again today - I just love that shop. Sorry if I'm a bore about it but I have such a tiny clothes budget so it's lovely to find a site with affordable fashion that you're not going to see everyone else wearing at the school gate. And I have to tell you about my Matalan sandals. These are another great summer buy. They've just been reduced to £5 in the sale and come in three colours. With the summers we have, I am all for spending your money on boots and shoes and saving your money on sandals! Finally, my lightweight short sleeved cardi is also from Room 31. Ruth and the team sent it to me for my birthday! What a lovely surprise when it and a couple of other items arrived in the post last week. I'll share the others with you in the next week or so! After seeing the photos, I decided to add a belt and I think the outfit looks better with it as it brings the sandals into the outfit more. The three year old took this picture and I added some flash so you can see that the cardigan is slightly sheer - lovely for layering. Great Jeans and what a bargain, I must check out that site! I have to say nobody would think you have a tiny clothes budget - you work it well sister! Do we live *that* far apart? It was *bucketing* here! 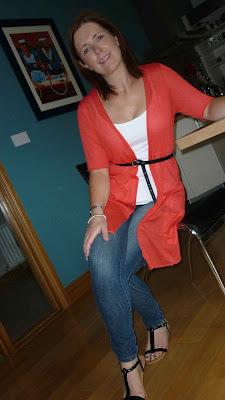 Really like the colour of that cardi! Those jeans are fab - love them. So jealous of your sun and style! Love the black belt over the cardigan - GREAT! I have a new love for Room 31 - it's not just the clothes and the prices but their customer service which is AMAZING - oh and the tissue wrapped parcels - I love that! How do you find the sizing at Room 31? After seeing a link on your blog, I ordered a top and some jeans from there last week. The jeans were ok but the top was tiny. I'm a size 12/14 and ordered a M/L I couldn't even get my shoulders in. I got my 14 year old to try it on, she's a size 6/8 and it just fit her. Quite disappointed by my first experience and not sure I will order again from there. That looks amazing, I hadn't heard of room 31 totally looking chic though lady! Will have to check out Room 31, seems like great bargains! 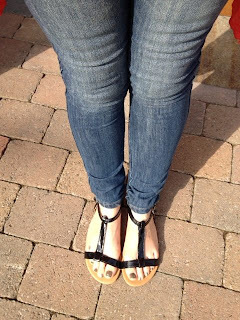 The sandals are cute too, perfect for summer! Ooh the Carrie & rhea. Definitely!